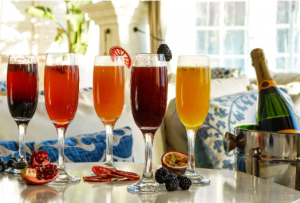 Look for Santuari’s “Santimosas”, a Special Fruit and Sparkling Wine Creation (Blood Orange, Passionfruit, Pomegranate, Blackberry, and Blueberry), Each For Only $5.00! LOS ANGELES, CA, UNITED STATES, February 7, 2019 /EINPresswire.com/ -- Nestled in the gorgeous city of Toluca Lake, SANTUARI RESTAURANT1, an exquisite new venue offering fresh Californian cuisine with delicious Mediterranean accents, welcomes guests for weekend brunches, starting this Valentine’s Day weekend, Saturday, February 16th & Sunday, February 17th, 2019, from 11:00 AM to 3:00 PM. Recently announced as winner of “Best New Restaurant – 2018” by the “Best of Los Angeles Award2” community, Santuari Restaurant has been a hit since its opening, with items on its diverse menu that everybody can enjoy.